A_ Insertion of a group of buildings. We understand the project as an opportunity of continuity and not a rupture.The project belongs to a greater set: A block formed by buildings from different eras. 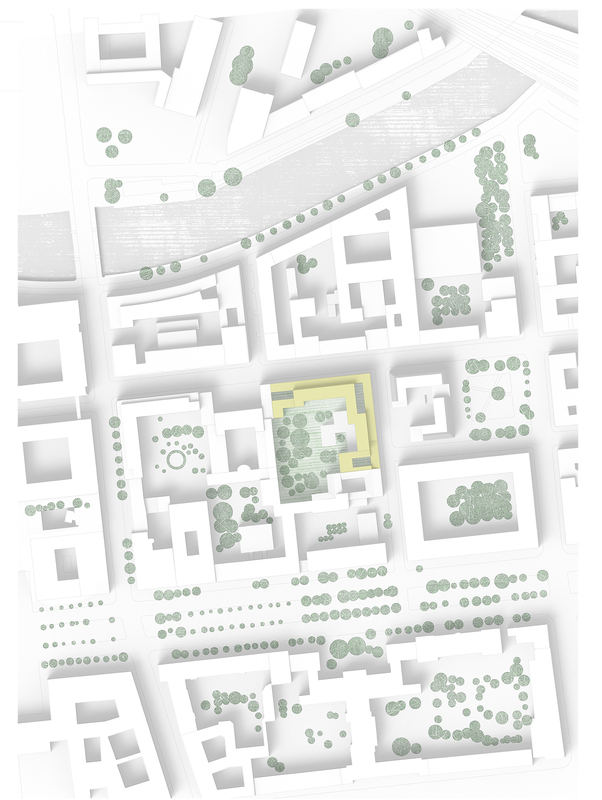 This is why the project is built from the dividing walls, positioning for a compact form to obtain the best interior courtyard possible.The building belongs to a system of interconnected buildings, for that, our project proposes a connection to each of the four buildings through a courtyard. 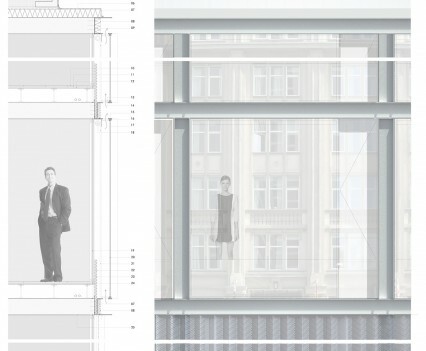 A demolition of an expansion is proposed and its offices would take part of our project, placing itself on the ground floor and strengthening the identity of the courtyard as a space for connection. B_ Volumetric and Programmatic Structure. We propose a typology based on two rows of offices joined together by means of a central element where the spaces of connection (the courtyards) and the service bays are located.Through these two linear parts of offices, the projects look for the urban continuity towards the exterior while proposing, going towards the interior, a much richer connection in ways to give the continuity of the geometric pass of the courtyard.The corner access generates a foyer on a diagonal with views to the interior courtyard and it optimizes the route of the workers, generating an external covered atrium that peeks out to the two streets.The three courtyards make a system of interconnected space. 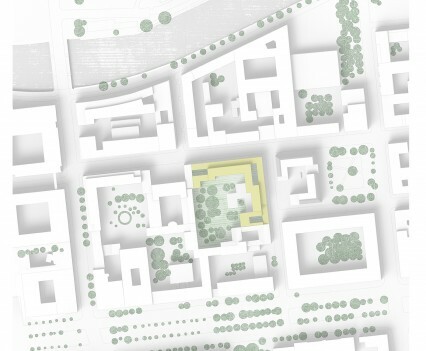 Each one of them takes on a different identity: Space of entry, space of connection to the adjacent building, and a meeting space.Programmatically, each project proposes that each department occupies only one level, avoiding unnecessary routes and facilitating the connections between the employees. The conference rooms are formed by the construction of the uneven corners orienting themselves toward the internal courtyard, thus avoiding noise and in turn being able to enjoy great light and views. These rooms are located alongside the courtyards to create synergies and points of clear encounters. 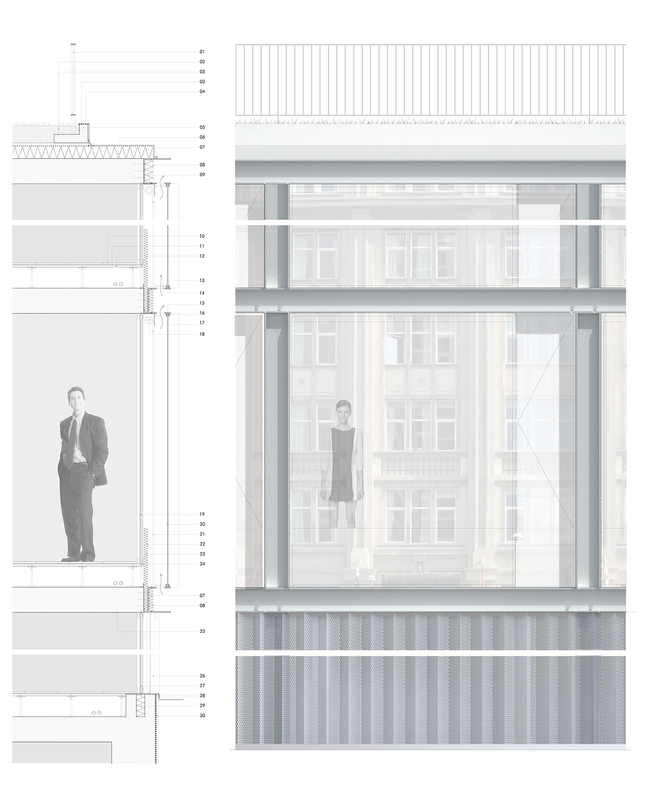 Project: Governmental Office for the Bundestag.